Via Ezra Klein, Here’s a chart from Larry Mishel that’s pretty astonishing. It shows that since 1972 the life expectancy of men with low incomes has increased by two years while life expectancy for men with high incomes has increased by more than six years. That fact that the haves are healthier than the have-nots doesn’t surprise me, but the magnitude of the difference is pretty stunning. The context here, unsurprisingly, is Social Security and whether we should raise the retirement age. Obviously, increasing the retirement age to, say, 70, is a much bigger deal for someone likely to live to 79 than it is for someone likely to live to 85. In my book, this is yet another reason not to try to balance Social Security’s books by changing the retirement age dramatically. And we probably don’t have to. There are plenty of other ways we could do it instead. 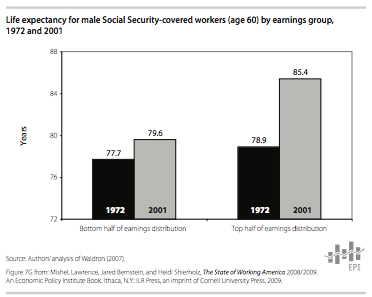 And if we do do it, this chart suggests a couple of things: (a) the change should be modest (maybe going from 67 to 68) and (b) it should be accompanied by an explicit acknowledgement that disability retirements will be routinely available at the same age as now to workers who perform body-draining physical labor. If you put these things together it’s not clear that this change is even worth pursuing, which I think is the whole point. If we insist on addressing Social Security in the near term, there are better ways of doing it than fiddling with the retirement age.